The frozen earth is a fertile zone for the gardener’s active mind. Seed catalogs, plot plans, old planting records and books about organic pest control and landscape design are the tools of dreamers who see beyond the white blanket hiding last year’s garden stubble and the remaining leeks. If you are a parent or a gardening teacher, chances are your dreaming and scheming about the upcoming growing season is set to the music of childish voices. And, alongside the plans for rows of spring peas and lettuce is a growing imagination of how how to work with children in the garden over the next season. Last year, I wrote a few blog posts about gardening with toddlers. I have compiled these and re-posted below for those who dream about children eating peas right from the vine, pulling stout carrots and finding hiding spaces in the corn patch. She sits on my lap, lining up sage leaves. Her little hand lifts the aromatic, fuzzy leaves from their water bath and lays them on the perforated tray that I will slide into the dehydrator. It is a bright September day on the back deck where we work together, steadily filling the trays with the taste of autumn stews. I scratch a sage leaf and smell it and she smells it too. I slowly place the leaves in tight rows, occasionally adjusting a leaf so it does not overlap. She imitates my actions carefully, re-positioning leaves that clump up. I don’t tell her what to do and she doesn’t ask. My hands give all the instruction she needs, a lesson in preserving food, in creating order, in cooperative work, in texture, scent, color, in the variability of the same form, big leaves and smaller leaves, all wooly, pale blue-green sage. I am happily surprised that with no verbal encouragement, she consistently makes neat rows with no overlaps even though she is not quite two years old. This is the end of a summer when we have often spent time together in the garden. I came to these sessions with a list of tasks that I might do, but with no goals other than to share one of my favorite places with a toddler. It would be a bonus if I pulled a few weeds, thinned some carrots or harvested lettuce. Today, so much adult work cannot be comprehended by children. But growing, storing and preparing food draw forth a child’s participation and understanding. Children who witness or take part in working with plants and animals enter into the essence of adult experience. In those moments of partnership, when they stand alongside us, or sit on our laps or ride on our backs, they develop the security that comes with glimpsing their productive future in the comfort of present connection. And, as we work together with our children, we adults can inch toward faith in the continuity of our most vital work. Growing and harvesting food while caring for a baby or a toddler may be the original and most important form of multitasking. Somewhere in your ancestral history a parent moved along a row of plants with a baby on her back and a basket slung over her arm. Our very existence is rooted in this pair, in centuries of parents and their children working together in gardens, in fields, forests, barns, blueberry barrens, rice paddies. When I think about this age-old image, the adult and the child, together growing food, I feel connected to and grateful for the multi-tasking farmers and gardeners, parents and children, past and present who have made my life possible. However, I feel fortunate to be in an age when I am not living in anxiety about getting a big harvest in before the frost. We have been blessed with time for noticing our children’s entry into the natural world and their satisfaction in their first attempts at real work. Long ago, when my daughter was two, I did not realize that toddlers might be able to do real work. I remember a yo yo experience in the garden, pulling a few weeds, chasing her across the yard toward the street, leading her back. Repeat. Repeat. Repeat. Since then I have explored ways to engage very little children in the real work of gardening. The key is choosing tasks that fit them. If you can find varied tasks that work well with their boundless energy and their joy in movement, you can help toddlers delight in being you partner in growing and you can get some work done. Make it a group effort. Children of all ages enjoy working with adults and older children. Make gardening an activity that is part of a playdate with parents and children. A group of adults working in a garden with an eye toward coming up with easy jobs can keep a little helper happy and busy. If you call out, “I need help over here in the tomato patch. Who can be my helper?” You are bound to get the answer “Me! Me!” and running feet will be coming your way. Then, if another adult calls for help when interest flags, your helper will be attracted to the new challenge. 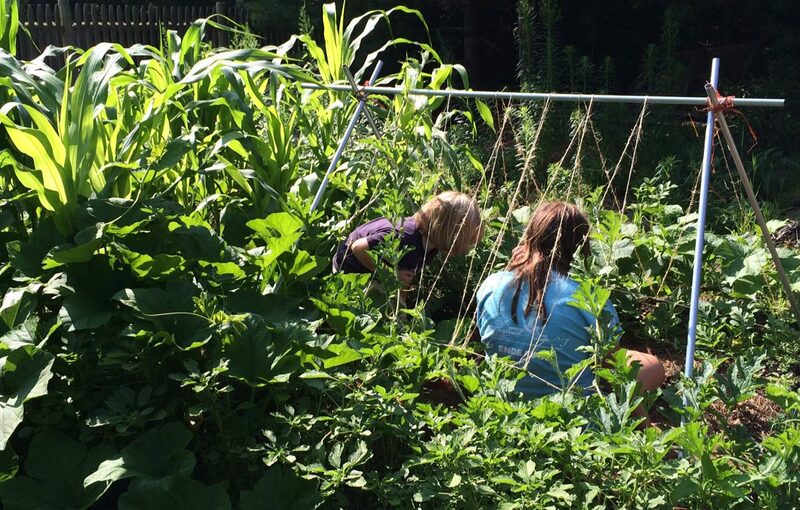 Working with an adult in the garden can help a child learn to extend his attention span. Nevertheless, don’t be surprised if five to ten minutes per task is typical. Give your child her own garden area. Once I gave a two year old a little patch of prepared earth and a package of lettuce seeds. This was my only involvement in her little garden bed of four square feet. She planted the seeds with no help, watered occasionally and, to my great surprise, had the best area of lettuce in our garden that year. A more involved approach is to give responsibility for a crop. At school, I start this in third grade. At home, this works from toddlerhood to teenagehood. One year I worked with a two and a half year old to grow a small corn patch. I opened the furrows and she carefully placed the seeds. She helped me close the furrows and to water. Over the summer I often said, “Let’s go look at your corn.” Together, we admired new sprouts, and noticed when the corn came to her knees, then her tummy, then her chin and ultimately far over her head. We observed the ears forming and peeked in to see tiny kernels. Harvest day was great fun. She relished the process of harvesting, shucking and washing and, when her corn was cooked and offered to her family, she beamed. Speedy delivery! Toddlers like being delivery people, especially when this involves running back and forth between two people. I remember a day when I worked with another adult and a two-year-old to harvest and bag a large bed of lettuce before a hard frost. I loaded loose heads of frilly green lettuce with red-tipped leaves into a baskets and she hefted one big basket at a time and carried it to the other adult who bagged the lettuce. Then she ran back with the empty basket, ready for the next load. While toddlers can have short attention spans when they are not directing their own activities, on this day we were priveleged to work side by side with a two year old for at least forty minutes as we witnessed this young person taking a big step into the world of real work. Fill a wide bucket with water and give your child a small watering can to dip in the bucket. This task can entertain for a long time and maybe even provide water to plants that are thirsty. Your helper will play as much as he works, but that’s OK. Choose a warm day so getting wet is not chilling. Supervise closely and constantly as toddlers can fall into some buckets and not be able to get out. For most crops, harvesting is easy and fun At school I often offer harvesting jobs to the early childhood teachers and their classes.. No matter what your age, the satisfaction of pulling carrots from their hiding places in the earth or carrying pumpkins to the garden cart is a real experience of finding treasure. For the young child, however, the greatest treasure in the garden cannot be dug, carried or eaten. It is the wonder experienced when the garlic pokes its nose through the spring soil, when the corn arches overhead, when an earthworm suddenly slithers across the damp earth. We will come back the theme of wonder in the garden next week. Wonder in the first years of life creates the roots of self-motivation. It is the foundation of a personal connection to the world, the nexus of the self. Wonder cannot be scripted. It arrives unbidden. And while we cannot call forth wonder just wen we want it, we can be expectant. The best a person can do is to be always listening, always watching, open to the possibility that something amazing might come our way, aware that it is possible, or even likely, that the marvelous will arise out of the commonplace, amid the happenings of everyday life. This openness to wonder is a transcendent state we aspire to as adults, yet it is the natural state of young children. One of the best gifts you can give your toddler and yourself is to find time to join him where he is in that expectant openness, to slow down, to see what they see and hear what they hear, to let go of deadlines, plans, goals, wishes, to just be together. There is no better place to do this than the garden. You might head to the garden with the intention of meandering with your child at her speed, following her interests. Or, you might be working in the garden with your little one nearby, sensitive to noticing a moment that calls you to put down your rake so you can kneel on the damp earth and let your toddler lead the way to the discovery of a blossom or a butterfly or a strawberry or the green spikes of the emerging corn he planted himself. A toddler’s mood of wonder can be fragile. Protect it by moving slowly, by dwelling in the fullness of silence, by noticing your child’s focus, using only a few carefully chosen words. Above all, don’t direct, explain or praise. When you find your way to becoming a companion to your toddler in an experience of wonder, you will find that time seems to stop. You may enter this realm for only four or five moments, but if you truly connect, if you drink in your child’s amazement, you will return to a place you once knew, a place where you lived as a child, where you feel beckoned to return. It is ironic that grown ups seek distant gurus to guide them to a consciousness of expectant, awareness when focused attention with a toddler, perhaps in a garden, might satisfy our mysterious yearning, might lead us back to the forgotten mindset our own early years. For, wonder is our first home. Toddlers and young children usually live in a sense of wonder that is not shared with adults. If you think back to your own early years, perhaps you can remember moments of fascination that you did not share, that you could not share, for you did not have the words. Once you re-enter a toddler’s world of wonder, you will be awed by the value of this consciousness. You will want to provide your child with undisturbed time in nature, in a forest, by the sea, in a garden. For many families, a garden is the most accessible natural area. It can be on a balcony, of a tall apartment building, or a single garden bed in a tiny back yard. For a child, it is a place to witness the magic of growth, to know the beauty of life, to find wonder. I love reading your article in th Washington post and I wonder if I can use an extract for my preschool instagram account and google profile and give you credit. If I do how do you want me to post the credit? Kim Allsup is the author of A Gift of Wonder, A True Story Showing School as it Should Be.